I’d probably quit my job and pour all of my time into Massive Pwnage. That, and buy a ton of video games that I’ve been meaning to play. And maybe a robot monkey butler. With a hat. This entry was posted on Monday, April 19th, 2010 at 12:00 am and is filed under Comics. You can follow any responses to this entry through the RSS 2.0 feed. Both comments and pings are currently closed. #5 :: Ride a giraffe wearing a top hat and cape, cackling like an evil villain whilst throwing strawberries at the spectators below. #1 :: tell my mom that I am now financially independant through collage so she can stop trying to run my life. #2 :: invest throughout collage and then found my own game company. 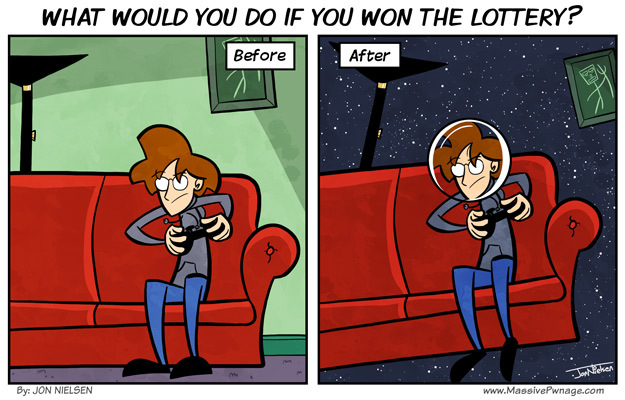 Depending on how much it was, I would probably end up giving a good chunk of it away too. Family and friends and maybe a charity or two. Paint one wall red, one blue, yellow, purple, green ceiling, orange ground. Just to confuse everyone. And distract them from my real plan: creation of the perfect RPG qualities in one place, not scattered through Final Fantasies and Elder Scrolls. I don’t think you need to win the lottery to paint your walls hahaha. Maybe you can get some kind of crazy 3D paint so no one can tell how far away the walls are. BUY A MEGACOMPUTER. MAYBE THEN IT WILL RUN CRYSIS. what’s the catch? catch 22. if you were stupid enough to *play* the lottery, you’d be stupid enough to lose all the money even if you won. 1# Never have to work again. I put a lot of thought into that question, actually. First, I’d pay off student loans. Then, I’d rent a nice apartment with a working toilet handle (don’t ask, mine broke off…). And then, I’d buy a giant hotel, refurbish it, and set up a safe-home for children who have been abused in the foster care system. There’s one house like that around my parts, but they can only have like… five children at a time. Hence, a big hotel. Yes. That is what I’d do.